The Three of Pentacles represents that you are reaching a first initial goal, and the beginning on a path of learning. When this Minor Arcana tarot card appears in your reading, it’s a call for teamwork and collaboration. Often is the beginning of a time of learning. This is represented by a young man entering into an apprenticeship with specialists. 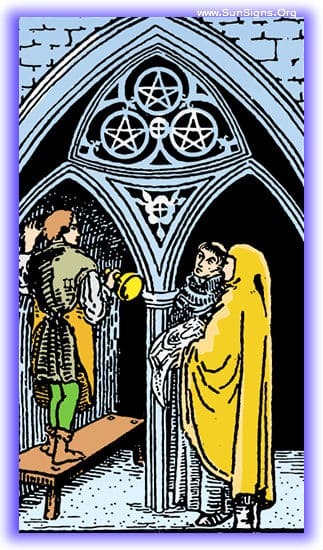 The Three of Pentacles represents the completion of a goal, but not a project. This is the ending of a beginning, much like the laying of a foundation. This tarot card is encouraging you to keep moving forward. With this initial groundwork laid the future is secure for the pursuit of your plans. It does come with a warning to make sure your plans continue to be well laid and organized. You have recently experienced success, and a solid foundation has been laid for everything to come after. This represents that you’ve been doing well in your progress, keeping things organized and well-thought out, not letting your initial success go to your head. 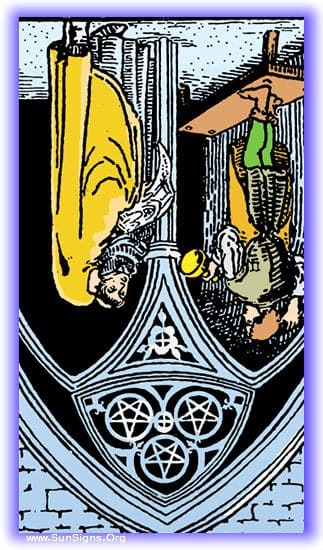 The Three of Pentacles in this position is calling for teamwork in your current project. It’s time to settle down, work with your companions, and pull together a cohesive and organized plan to proceed. You’ve got a good foundation, time to build on it! Just ahead of you is the first important step of your plan. You’ve been working really hard to drive this thing forward, to get past the planning stage and to motivate yourself, and you’re about to reach your first reward! Keep it up! The Three of Pentacles reversed represents a lack of teamwork, or an overabundance of competition amongst those who are working together. Vanity is really prevalent here, wanting to be seen as the best or the brightest, rather than focusing on getting the project completed. When this tarot card appears it’s time to consider leaving the group you’re working with or changing its composition. Infighting and competition have been interfering with progress for the past few months. With the team you’re working on there is no cooperation, this may be a sign that after such a long period of trouble, it’s time to abandon this team. You’ve been going through a struggle in your current project, and it seems like everyone is infighting. This team is not working well together, and getting to the root cause is of paramount importance to overcome it. Your work is satisfying you currently, but before long you will be finding yourself becoming restless. What you thought would be an opportunity to show your experience and have your contributions appreciated is instead going to be a menial task that leaves you little to no opportunity to be heard and contribute. Best start planning now for a move, even if it’s lateral.